I wasn’t sure that anything could top LL’s post on the failed fit that was Bikini Jeans – yikes. Yes, this past weekend was the much anticipated bachelorette party in Vegas, and the abundance of failed fits was remarkable. 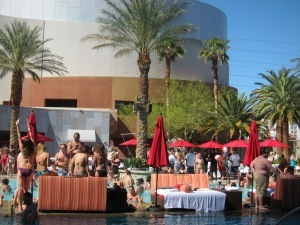 One particular failed fit occured at the Palms Hotel pool party. Now, my girlfriends and I would not normally be hanging out at the Palms pool…Jersey Shore anyone? The pictures don’t quite capture the d-baggery of this party. You had to be there. However, the people-watching was phenomenal. Though the party was not our usual “scene,” the 8 of us ladies tried our best to embrace the experience. Had we worn thongs, we might have looked like locals. Thongs were the norm at the Palms. But let’s be honest- a thong alone is not enough. A Palms Pool Party Patron (PPPP) needs to make a statement. And the best way to make a statement? A thong UNDER your bikini…. Yes, look closely. That’s a thong UNDER the bikini. Now I’ll admit. This post could be interpreted as a little mean.